We show you the weather now as well as today’s weather in Mojacar, the latest current temperature in Mojacar and the conditions in Mojacar i.e. sun, cloud, rain, overcast, clear, etc as well the humidity, pressure, wind direction and wind gust strength. You can click on the graphic and get a much more detailed weather outlook including: tomorrow’s weather in Mojacar, long range forecast, a weather map showing any pressure systems, visibility, UV, pollen count, dew point, where the weather station providing this data is located, a 5 day, 7 day (week forecast), 14 day, 15 day and 10 day forecast for Mojacar weather. The Costa Almeria is known to be the hottest, driest region of Spain with a desert-like climate and over 3,000 hours of sun each year. This means the weather in Mojacar is likely to be ideal for a holiday as there is little chance of rainfall and almost guaranteed sunshine and blue skies. However many from Northern Europe will find it too hot in the peak summer months of July and August as temperatures often hit 40 degrees Celsius. Mojacar is a popular tourist destination due to its superb sandy beaches which draw tourists from all over Europe as well as Spain. You can see live weather conditions and images from these webcams. Mojacar on the Costa de Almeria is made up of two very different parts; the traditional hilltop village of Mojacar Pueblo and, in complete contrast, the modern coastal strip of Mojacar Playa. The former is a very attractive village, with its steep, narrow streets of cube-shaped, whitewashed houses. To get there either hire a car from the major international airports or hire a car in Mojacar itself if you just want to take the off excursion or two. Many people are also choosing to live in Mojacar due to the excellent all-year round weather conditions and low property prices relative to the other Spanish Costa’s. This page gives you information on all aspects of Mojacar weather. We have a description of Mojacar’s climate, we have today’s weather, we have up-to-the-minute current weather temperature for Mojacar as well as a more detailed 10 day forecast for the weather in Mojacar. From June to September the weather in summer in Mojacar is typically very hot with little to no rainfall. Summer temperatures in Mojacar will mostly be between 25 degrees Celsius to 35 degrees Celsius during the day. Temperatures at night in the summer in Mojacar rarely drop below 25 degrees Celsius and there is virtually no rainfall in the summer months. Peak month are July and August. Fortunately being on the coast Mojacar benefits from cooling sea breezes which give some relief. Also the heat tends to be a dry heat with low humidity so it doesn’t feel as hot as you would expect. At night temperatures in Mojacar rarely drop below 20 degrees Celsius. Always wear a high sun cream factor in summer, keep well-hydrated and when looking for your accommodation look for hotels, villas and apartments with air conditioning or fans. Mojacar in Costa Almeria really is a great winter sun destination compared with other areas of Spain. For many people looking to escape the harsh winters of Northern Europe the climate of the Costas further north such as Costa Blanca, Costa Brava, Costa Azahar and Costa Dorada may not be warm enough and they also have much more rain. Winter in Mojacar is very mild with up to 6 hours of sunshine a day in December, January and February and daily high average temperatures of 15 degrees Celsius with lows of only 6 degrees Celsius. This makes the winter weather and climate in Mojacar perfect for older people especially those with health problems. Most days are clear and sunny and rainfall is infrequent and usually short. The autumn months of October and November usually has some very pleasant weather although it is more changeable. It is a great time of the year to visit Mojacar. Most autumn days in Mojacar will have daily high temperatures of around 18 to 23 degrees Celsius although night temperatures are cool. Skies will be clear and sunny mostly although there is rainfall, usually short showers. Even the sea is still relatively warm from the summer. Spring in Mojacar begins in March with slowly increasing temperatures. In April the daily average high temperatures begin to hit 25 degrees Celsius. From this point many people would consider swimming in the sea. 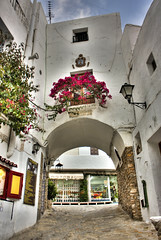 May is a great month to visit Mojacar as temperatures are hot but not to the extremes experienced in July and August. Spain’s climate is known as one of the best in Europe with year round sunshine and low rainfall. Mojacar’s location on the Costa de Almeria means this is even more extreme. 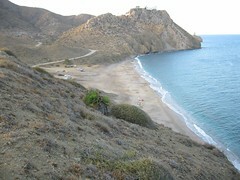 The Costa de Almeria is an extremely dry region partly made up of deserts. Mojacar is protected by the Sierra Cabrera mountains. Most rainfall is recorded in October and February. With little green vegetation you would expect the scenery to be dull but in fact the rocky landscape is very striking. Many people are confused as to the difference between weather and climate. We can describe the climate and temperature in Mojacar as being based on long-term measurement of the weather with satellites, radar, charts and other meteorological equipment. This gives a typical idea of what the conditions of Mojacar will be for certain times of the year. The weather however is a short-term snapshot and each day can be completely different. Reading this section on the climate of Mojacar gives you an idea of what you should expect each season and month to be like when visiting Mojacar, Spain.